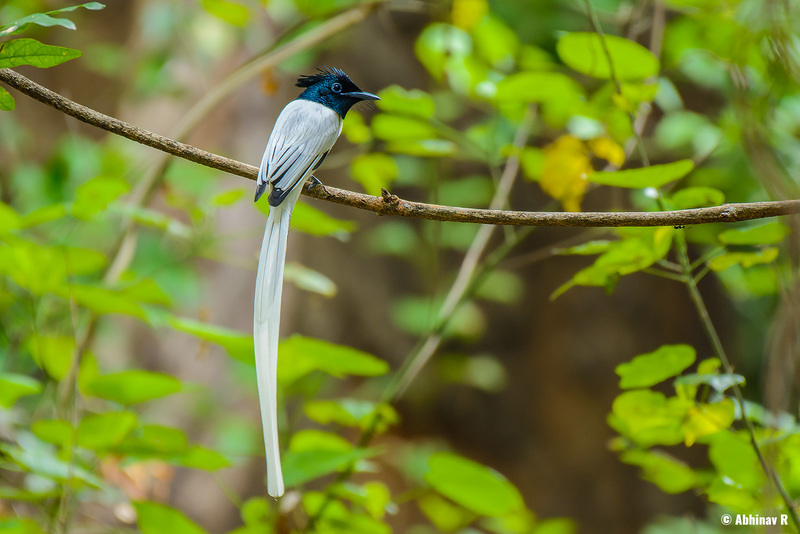 Indian Paradise Flycatcher is a bird from the Monarchidae family. Until 2015, it was also known as Asian Paradise Flycatcher when it got divided into three different species. The white morph of the male. Date: Oct 27, 2016. A female Indian Paradise Flycatcher. Date: Oct 26, 2016. Both the above two photos are from Chinnar Wildlife Sanctuary on two consecutive days. The photo of the male is from the side of Chinnar river flowing inside the sanctuary. We were doing the Chinnar-riverside Trek. A Grey-headed Canary-flycatcher was also present there at the time while photographing this. Got the photo of the female while returning from Thoovanam waterfalls the day before. The location was somewhere near the side of Pambar river. It was busy hunting small insects along with other flycatcher species – probably a Black-naped Monarch as I remember. Appearance: The male and female bird differ in appearance. The male itself shows two morphs – white and rufous. The photo above shows the white morph. In the rufous morph, the upperparts have rufous color instead of white. Underparts are white in both the morphs. Males also have long tail feathers which are about 30 cm in length. The head is shiny blue-black and there is a prominent crest also. The female has rufous upperparts and white underparts. It also lacks the long tail feathers of the male. Unlike the male, the female has gray throat and faint eye-ring, whereas the male has dark blue-black (similar to head) throat and bright blue eye-ring. Juvenile males look very similar to female but differ in throat color and eye-ring. Size: Around 20 cm excluding the long tail feathers of the male. 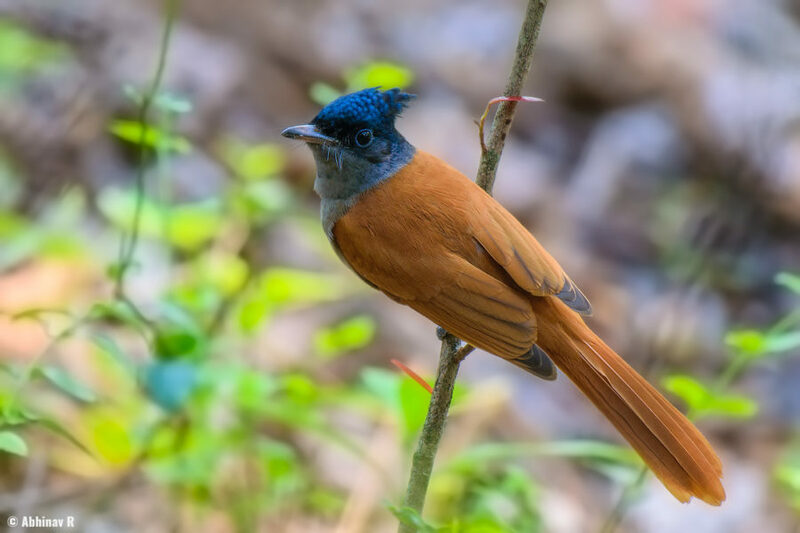 Distribution and Habitat: Indian Paradise Flycatcher has a wide range of distribution across Asia. Main habitats are light forests and open areas. I have so far spotted them at Chinnar and Thattekad.